Chris Violence Reveals "In Speed We Trust" Music Video Artwork! 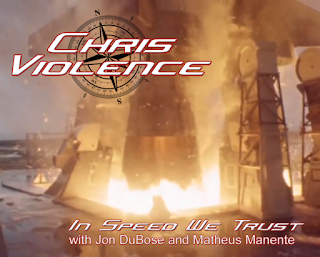 The American thrash metal singer Chris Violence unveil his upcoming music video artwork. "In Speed We Trust" is the new single and music video that he has been working on lately. The recording process was conducted at the home studios of Jon DuBose (bass and rhythm guitar) in the United States, Matheus Manente (drums and lead guitar) in South America and Chris Violence (vocals) in Italy. This song includes an intro production created by Danillo Battistini featuring the voices of Danilo Battistini, Fiona Thraille, Matheus Manente and Steve Blitzin. Chris set the release date of the music video of "In Speed We Trust" on Thursday, May 31, 2018.